Above legendary miners' leader Arthur Scargill addressing the crowd at this years event. 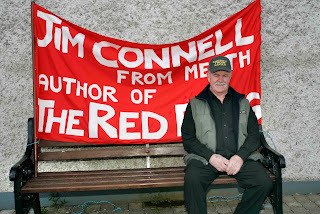 On May 2nd 2010 I attended the annual Jim Connell Commemoration Parade in Crossakiel. It was the 12th annual event and my first time to be there and I must say, if the Lord spares me, it won't be my last. At a meeting in Kilskyre Hall 28th March 1997 a committee was set up with a view to erecting a memorial to the famous son of Kilskyre, Jim Connell, who was born there in 1852. On 26th April 1998 a monument to Jim Connell was unveiled in Crossakiel, Co. Meath, Ireland on the spot where he addressed a crowd of 600 in 1918. Jim Connell wrote the Song " The Red Flag " in 1889 while travelling on a train between Charing Cross and New Cross in London. It was written first to a tune called " The White Cockade " a lively Jacobite anthem but was later set to the music " Tannenbaum " and old German hymn. It quickly became the anthem of the International Labour Movement. Pictured above Michael "The Sheriff " Sheils.